Author: V. Dimov, M.D., Published in the Proceedings of the 3rd Annual Cleveland Clinic Perioperative Medicine Summit, CCJM. 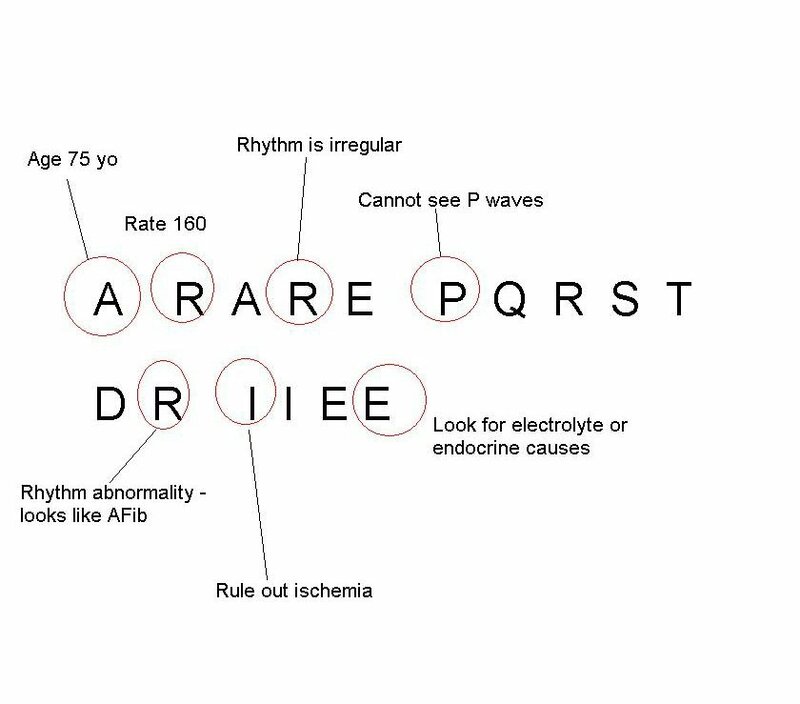 Step 1: Evaluate all elements of the EKG systematically: A RARE PQRST. Step 2: Differential diagnosis. Look for diseases that may have caused the abnormalities noted in step 1: DR III EEE ! This systematic approach to reading electrocardiograms (ECGs or EKGs) works every time, just like a machine. By using it, you will not miss any major abnormalities in electrocardiograms (EKGs). 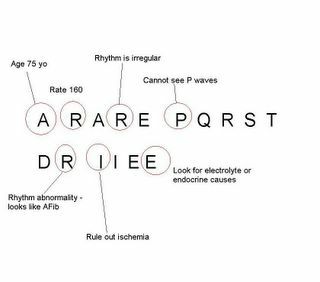 What is the meaning of the mnemonics? Rate, e.g. fast or slow? Axis, e.g. left or right? Rhythm, e.g. regular or irregular? P wave, e.g. peaked or absent? PR interval - short or prolonged? Q wave, e.g. deep Q wave? QT inerval - - short or prolonged? ST segment, e.g. elevation or depression? T wave, e.g. peaked or inverted? U wave? Rhythm and rate abnormalities, e.g. AV block of 1,2,3 degree, AFib, SVT? Interval prolongation? Enlargement, e.g. LVH, RVH, left or right atrium enlargement? How to use this approach in practice? Circle the abnormalities you discover in step 1 -- A RARE PQRST. Then, connect and try to explain these abnormalities by looking at the list of possible etiologies presented in step 2 -- DR III EEE. That's it! A systematic approach to the EKG of a patient with AFib (click to enlarge). Proceedings of the 3rd Annual Perioperative Medicine Summit, Cleveland Clinic, September 10-12, 2007, CCJM. ECG Wave-Maven by the Harvard Medical School and Beth Israel Deaconess Medical Center. The lost art of electrocardiography - DoctorRW.blogspot. Reading an EKG - UAB.edu. ECG scribbles. An Approach. Anaesthetist.com. Can't-Miss ECG Findings, Life-Threatening Conditions: Slideshow. Medscape, 2009. Audio lecture: Basics of EKG. Dr. Dwight Dishmon. Podcasting Project for the UT Internal Medicine Residency Program, 2006. ECG Video part 1: For Med Students studying the basics of reading an electrocardiogram, from the University of Wisconsin. This was really helpful for my assignment thanks!!! !